Did the Central banks lose the war? Because bonds are a natural hedge of other asset classes such as equities but it means that you MUST favour high-quality bonds only, with good liquidity and without high correlation to equities in order to deliver positive performance when stock markets are in negative territory. 2. What are the asset classes that should be favoured? In EUR, we favour APP (Asset Purchase Program) bonds (Govies + PSPP + CSPP), i.e. bonds bought by the ECB (EUR 80 billion/month) and in USD, we stay overweight long US Treasuries (both 30y nominal bonds and TIPS which are inflation-linked). In USD, we also favour high quality emerging bonds (but high quality only). We avoid any kind of bonds which eventually behave like equities in bear markets (high yield, deeply subordinated bank debt). 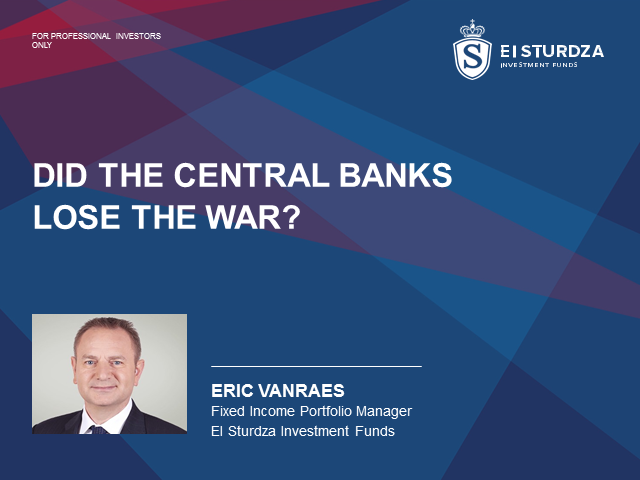 Title: Did the Central banks lose the war?